Following the Lady Warriors' loss in the Central Section Division II semifinals, one could probably ask a lot of questions. First, how is a school like Tehachapi playing Bakersfield High, a team with more assistant coaches on the bench than the Warriors have players? Or, what is a school with less than 1,200 enrolled doing in Division II among large-city powerhouses with enrollments twice that? But then again, we all know the common-sense train stops just shy of the Central Section office in Porterville. Maybe that train suffered the same fate as the California High-Speed Rail project. Who knows? Then again, in competition, you play who the schedule makers put in front of you. It’s just the way it goes. Those feelings aside, the Tehachapi loss brought back similarities to another team I followed closely, the 2013 Cal State Bakersfield baseball team. They won the Western Athletic Conference regular season that year, a year that the WAC was full of Texas baseball powerhouses, not the hodgepodge of institutions it has since morphed into. However, winning the regular season didn’t guarantee a spot in the NCAA Regionals. CSUB, playing in an oddly-configured conference tournament, essentially fell one pitch shy of that dream. It was an inside fastball ripped down the line by UT San Antonio that scored a run, and CSUB lost. The following season, then-head coach Bill Kernen, one of the most brilliant motivators I’ve ever come across, unveiled the team’s new practice shirts. On the front they read “Not Good Enough.” Now, before you categorize this as detrimental to young people’s self-esteem, let me give you the details on the back of the shirt. It simply said “YET.” And that was the message: While the 2013 season was respectable, it wasn’t good enough — yet. It took two more seasons, but in 2015 some of those young men who experienced the heartbreak two years prior made it to the NCAA Regionals, and they even knocked out SEC powerhouse Ole Miss in the process. The message rang true — in 2013 they weren’t good enough, yet. The Lady Warriors are in the same boat. BHS was the defending Division II champions. They’ve appeared in four-straight Division II finals in Fresno and are now back-to-back valley champions. As wrestling legend Ric Flair famously coined “to be the man, you gotta beat the man!” And BHS is still “the man.” Tehachapi just isn’t good enough, yet. I stress the yet, because unlike the Roadrunners baseball team I compared them to, they won’t have to wait two seasons. Tehachapi graduates just one senior starter and will have an experienced starting five next season, a little bit wiser, a little more understanding of the requirements of championship basketball team and hopefully a little hungrier to get their hands on that CIF Championship. Nothing is as motivating as disappointment. Jimi Perkins led his team to a 22-7 record this past season. That's not bad for a guy who wasn’t supposed to be the head coach. Heck, it took most of the season for him to officially be given that title. Bu, he never wavered from basketball, he never lost focus for his team, his team never quit on him. Jimi Perkins belongs at the head of THS Lady Warriors basketball for the future, and I believe he’ll stay there. While there is plenty of focus on next season, I’ll be honest: From the reports I’ve heard, the next several years of girls basketball look strong, even going back to middle school, with girls who were previously coached by, you guessed it, Jimi Perkins. There is a lot of talent waiting in the wings. 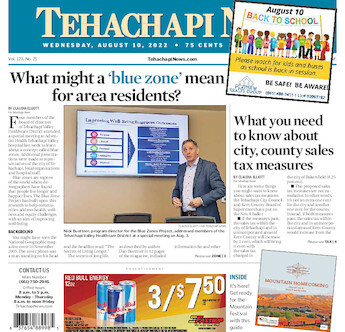 So, we will live with the fact that Tehachapi just wasn’t good enough, but we emphatically end that statement with a resounding “yet,” and know the future is bright with possibilities for several more championship runs.